Miss out on December's El Gordo jackpot? Luckily for you we have another massive Spanish lotto jackpot ready to be won! Meet El Niño – The Spanish Christmas lottery's little brother, complete with its £570 million prize pool. Read on to discover the origins of El Niño, how it works and how you can win it! In Spanish the term El Niño means child (or the Christ child), which is why this lottery is often referred to as the 'little brother' of the famous El Gordo. Although Loterias y Apuestas del Estado (the Spanish lottery organisation) state the first draw took place in 1941, little else is known about those early days of El Niño. In fact, there is no written record of an El Niño draw until 1966. Some sources imply that it was launched on the orders of General Franco, and the first winner was located in Sevilla. Originally the draw took place on January 5th, but was changed to the 6th in 1999, to coincide with Epiphany, the date on when, in the Christian faith, the Three Wise Men visited the baby Jesus. This surprising lack of documentation is in stark contrast to its older brother El Gordo, whose history has been thoroughly recorded since its foundation in 1812. You can read more on the history of El Gordo here. In terms of format, El Niño is similar to a prize draw with numbers ranging from 00000 to 99999, much like the Spanish Christmas Lottery. 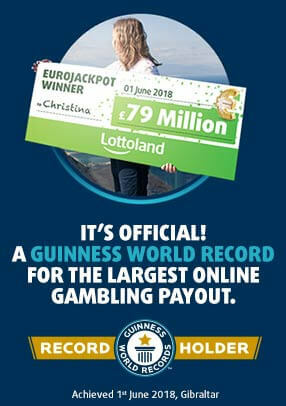 In Spain some people have been known to drive for many hundreds of miles to grab a ticket with the right numbers, however at Lottoland we've made betting on this jackpot a whole lot simpler! Betting on El Niño could not be easier, just follow these simple steps and you could be in with a chance of claiming your share of the £570 million jackpot! ♦ Head over to our El Niño lottery page. ♦ Select your five numbers by using the up and down arrows on the Betslip. ♦ Choose what size share you wish to bet with, from the seven available options. ♦ Purchase your lotto line bet. Wondering what shares are? Don't worry, we've got this unusual lottery feature explained – read on! Much like the Spanish Christmas Lottery draw, El Niño tickets are distributed in a prize draw style format, with numbers ranging from 00000 to 99999. On top of that, numerous series of these tickets are printed. This means that the number 12345 might be held by several people, and they would all win an equal share of the prize pool. In last year's El Niño draw there were 40 series in total. Take a look at this screengrab of our El Niño Betslip. You'll see that a 1/1 bet share costs a whopping £249.99 – a bit more than we're used to paying for a bet! Of course, for £249.99 any winnings you have are far larger than the other shares, and you'd walk away with a bigger percentage of the prize pool. Traditionally, however, El Niño (and El Gordo) lines are bought in smaller amounts, or families and friends group together to purchase a full share between them. This means that if they do win, they can split the money between them. It's a great way of winning big without breaking the bank, and a nice way to share prize money with loved ones. Why do these lotteries run like this? It's a good question, and the format can often seem unusual to us Brits who are used to draws where the majority of the prize money goes to one lucky winner. The reason is because El Niño, like El Gordo, aims to spread wealth around, not just make one person super rich. It's a great change from traditional formats, and one of the reasons that they're so popular here at Lottoland. With £570 million to be won you won't want to miss out on Lottoland's amazing El Niño jackpot, so start betting today! El Niño Lottery - Your Betting Guide!